With their contract expiring at midnight Tuesday, July 1st, the Screen Actors Guild is on it’s 42nd day of “negotiations” with the AMPTP. Let’s put these marathon and fruitless days of bargaining in their proper perspective. The WGA took 23 days to reach a deal, the DGA only 8, AFTRA’s “Network Code” 14 days and AFTRA’s “Primetime contract” 17 days. The problem here is SAG has inept leadership led by President Alan Rosenberg and it’s hired gun, National Executive Director, Doug Allen. Rosenberg is an actor with an un-spectacluar career and knows little about contract negotiations because his agent was the one who negotiated all his deals. Doug Allen knows even less about the entertainment industry because for twenty years he was the Assistant Executive Director of the National Football League’s Player Association! The only skills Rosenberg and Allen bring to the table is that Rosenberg can read a script and Allen can kick the proverbial football around a lot. Due to SAG’s procrastination many films have delayed their start of production and television shows are either taking the month of July off or delaying their filming well into August or September. Los Angeles is going through a de-facto strike after just starting to gear up again after the disastrous four and a half month WGA strike. The Milken Institute reported that the WGA strike will cost the California economy a projected 37,700 jobs and $2.1 billion in lost output through the end of 2008. The Los Angeles Economic Development Corp. estimates when factoring the multiplier effect the total loss amounts to $8.2 billion. The AMPTP as well as the Intl. Cinematographers Guild have accused SAG of stalling — and here’s the reason why: SAG has embroiled itself in a bitter intra-union fight with AFTRA. The two unions used to negotiate their contracts in tandem over the last thirty years. However in March, when SAG’s Board of Directors showed little interest in sitting down and bargaining, AFTRA decided to go their seperate way. The result was that AFTRA successfully negotiated a new contract and it’s membership is likely to ratify it when their vote results are announced on July 8th. 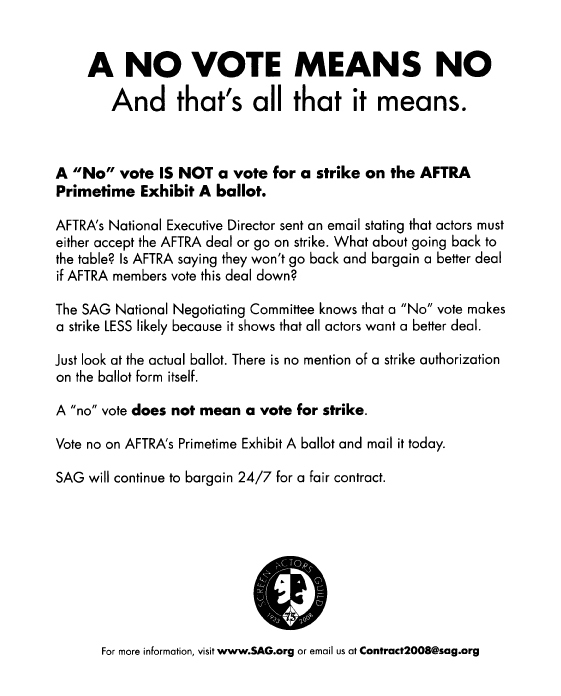 SAG does not want AFTRA to approve the contract and has spent lots of money and mostly time devoted to it’s defeat. “SAG has not brought anything new or promising to the bargaining table and a factional riff within SAG’s membership is threatening to not only damage the union itself, but the industry as a whole,” Poster denounced the guild leadership as “dysfunctional” in describing what he termed “the sad state” of SAG’s negotiations. SAG President Alan Rosenberg said on Sunday, “We have taken no steps to initiate a strike authorization vote by the members of Screen Actors Guild.” The process to authorize a strike would take about three weeks. Meanwhile my show has stopped shooting for the month of July and the film industry is suffering as the incompetents at SAG keep reading from the wrong script. News on SAG contract talks as it happens. UPDATE: From the Hollywood Reporter: As the clock ran down Monday, the Alliance of Motion Picture & Television Producers took their last shot: a final offer worth more than $250 million in additional compensation to SAG members. The offer signals the end of formal talks between the AMPTP and SAG. After this, the AMPTP will not accept any new proposals or bargain on existing proposals by the actors’ union. The AMPTP has agreed to meet with SAG on Wednesday at 2 p.m. to answer questions about the offer, but that’s it, sources said.